Evidently Peter and his work mates were not good tenants. During their stay they caused a great deal of damage at the house and John Evelyn was not unhappy. 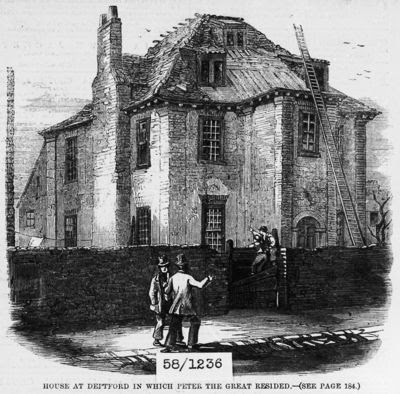 His estate reported that Peter's partying, which was full of 'right nasty' people, had wrecked the house and garden. Carpets were left filthy with grease and ink, and many paintings were use as targets for shooting. Locks and windows smashed and of the fifty chairs left at the premises none could be found. Probably used to keep the fire going! A keen gardener, Evelyn was shocked by damage to his holly hedges, lovingly cared for over a twenty year period. Apparently Peter and his friends had played a riotous game which involved pushing each other through the hedges in wheelbarrows! The King's Surveyor, Christopher Wren was ordered to report on the damage, and recommended that Evelyn be paid £350 in compensation, a huge sum in the 17th century.